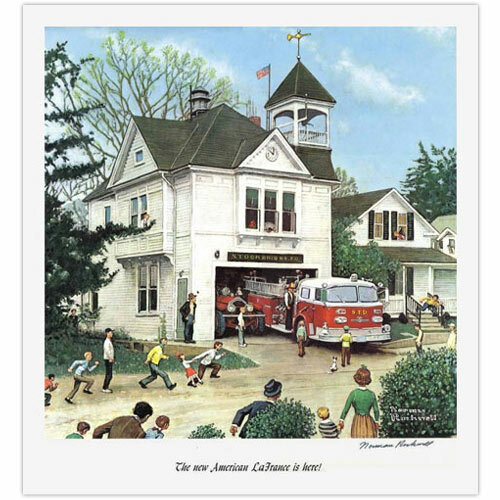 Norman Rockwell (1894 to 1978) The New American La France is Here! 1971 Advertisement illustration for ATO, Inc. American-La France fire engines Photo-offset lithograph hand signed in ink. This limited photo-offset lithograph entitled The New American La France is Here! measures 24 X 26 inches and is hand signed in permanent marker by Norman Rockwell on the lower corner. The print has wonderful detail, vibrant color and is listed in excellent condition. Five full-color oil paintings were commissioned by ATO in the early 1970's. Each advertised a product manufactured by ATO's subsidiary companies, including sporting goods, fire protection tools, and construction equipment. Rockwell used the Stockbridge fire station on Elm Street for this advertisement for ATO American-LaFrance fire engines. Passersby and people looking from windows to admire the new fire engine gave the picture human interest, and by sliding the house on the right closer to the firehouse, a village scene was created. Since the ad copy revolved around replacing a beloved old LaFrance with a new one, Rockwell was asked to substitute an old American-LaFrance for the town's old Ford fire engine. "Fire Chiefs know us. So do little boys. ...It's a big day for everyone in town, welcoming the new American LaFrance. During it's decades of service, it will lead countless parades and be inspected by scores of big-eyed little boys. But most of all it will protect the homes, schools and businesses in the town. Because protection is what this new American LaFrance fire engine is all about." Selection from the original 1971 ad copy.